From a story by animation legend Bruce Timm comes an all-new DC Universe animated movie. When a break-in at S.T.A.R. Labs leads to a secret dossier being stolen by the gruesome duo of Poison Ivy and Floronic Man, aka Jason Woodrue. It's a green light for crime and mayhem. The Dark Knight and Nightwing are on the case, but they look to a certain wild card for help: Harley Quinn! Recently released from Arkham Quinn! 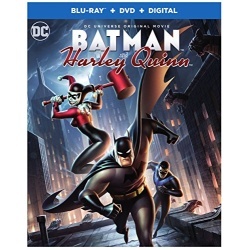 Recently released from Arkham Asylum and trying to acclimate to life out of the super villain spotlight, Harley finds herself suiting up and mouthing off once again, So pucker up, puddin' - Kevin Convoy, Melissa Rauch and Loren Laster highlight a stellar cast in this action-packed adventure filled with high-speed chases and brawlin' bad guys. Who knows, maybe even Batman evil have a good time!